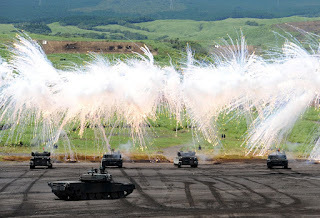 Japanese Ground Self-Defense Forces tanks move amongst an umbrella of barrage during an annual live fire exercise at the Higashi-Fuji firing range in Gotemba, at the foot of Mt. Fuji in Shizuoka prefecture on August 21, 2012. The annual drill involves some 2,400 personnel, 80 tanks and armoured vehicles and 30 aircraft and helicopters.